Recently I have been trying a couple of new things, new hobbies, new cafés hopping and going to start a new job soon. Well if not now, when? So here I just tried the new app nect™. 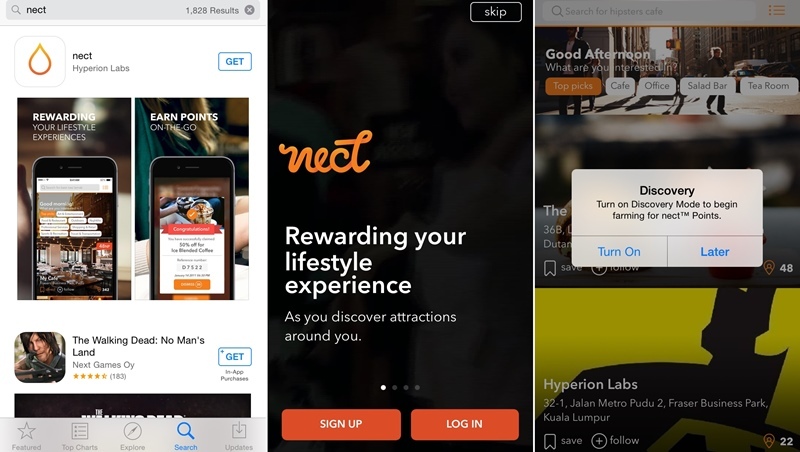 Something special about this app is that it rewards me in everything I do and everywhere I go, Nect Rewards My Lifestyle Experiences. 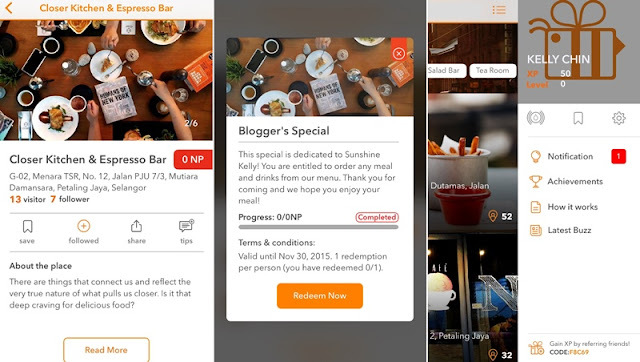 As long as the place is one of nect™ participating outlets on then I will automatically accumulate points. I know we have many apps on our smartphone so you might ask why do I need this app? Well, if you are an outgoing person and regular hangout at the cafes with friend or those who like to do café hopping on weekend with your partner or friends then you should download nect™ on your mobile. Let’s start, nect™ is a very simple app to use. As necters or nect™ users we can harvest nect™ Points (NP) without even taking our phones out of our handbags or pockets. Harvesting points are done automatically whenever we go in nect™ Beacons installed in all nect™ powered locations. necters will receive 1 nect™ participating Point for every 5 minutes for up to an hour at each location, and the accumulated points can be used to redeem specials at the same location. I was at the Closer Kitchen & Espresso Bar, Mutiara Damansara on Sunday evening for dinner. Great! this café is one of nect™ participating outlet too. Oh ya make sure that my Bluetooth and my nect™ app discovery mode is on also. As I entered the café I saw there is a nect™ QR sticker on the right side wall so I walked closer to it and found out that there is Blogger’s Special that I can redeem. Yeehaa!!! Thanks nect™ and Closer Kitchen & Espresso Bar. Overall, the café environment at Closer Kitchen & Espresso Bar so cozy and comfortable to chill, work, a great place to meet and have a discussion. I love the zen décor and high ceiling. From outside it looks like a posh restaurant. I bet lunch on weekdays is pretty busy here but weekends coffee catch up is perfect. They have varieties of decent food selection from all day breakfast, sandwiches, pasta, pizza, pie, soup, salad and etc. Coffee is good with the soft music playing at the back and also free wifi is available. Price range is about RM20 for main food and RM10 for coffee. Oh ya before I left I checked my points.., tadah! so I earned 50 XP (Experience Points) that can be accumulated to advance to the next level of app usage. Upon unlocking new levels, I can enjoy point bonuses to speed up unlocking greater Specials. Wow this is great without doing much. So I every time I go café hopping preferably the cafes with nect™ I can gained points too. Besides this as a necters I will also receive updates from retailers regarding exclusive deals through the app. Well, why do I like the app? As a coffee lover and café hopper nect™ compliments and rewards my lifestyle. So why not, right? I can have additional benefits and points while I don’t have to do much just on it and it automatic detect and accumulating points. Sometimes I get free coffee or food and maybe new surprise too. You too can download nect™ mobile app. It is free and available on App Store for iOS and Google Play for Android platform. All you need is to do after you have download the app are these 4 steps. Enjoy and have fun. Step 1: Turn on the discovery mode and make sure that your Bluetooth is on. Step 2: Farming nect™ point whenever you walk into the any stores or cafes with nect™ logo on the front of the store front is nect™ powered locations. For every 5 minutes you are in the premise you harvest 1 NP. Step 3: Unlock Special, when you have enough NP points you can Unlock Special. Launch the special screen and scan the QR Code provided by the cashier. Step 4: As we use the nect™ app over the time we will gain the Experience Points (XP). We can also gain XP by farming NP, redeem Specials or completing Achievements. We need XP to Level Up to reach the next level and enjoy double NP bonuses. nect™ is built based on iBeacon technology and developed by Hyperion Labs Sdn Bhd, a development studio established in 2014. according to Bobby Ong, CEO of Hyperion Labs Sdn Bhd, iBeacon is an emerging technology soon to be adopted in all mobile apps, as tech giants like Facebook, Google and other Silicon Valley enterprises. Hey do you like coffee? Here I have a good news for you, unleash your photo cafe creativity and share with nect your best coffee moment at your favourite cafe and win RM500 cash or 1,000 FREE cups of coffee. It has to be café within Klang Valley. Contest period from October 12 to November 13, 2015. 2 winners will be chosen every week to receive a cash of RM500. 1. Download nect™ from Apple App Store or Google Play Store and sign up a nect™ account and follow @nectarize on Instagram. Your Instagram account must be made public. 3. Each post will be regarded as 1 entry. You may submit more than 1 entry but you may only win 1 prize. You manage to come up with lots of interesting apps. It is great that now I can earn more by hanging out with friends and the weekly win is also the cream of top of it all. A new apps for me. A bit similar with other apps like open rice or hungry go where. Want to download and try this apps. I love getting rewarded for things that I normally do, without having to go out of the way. Will get this app right now! this is something new for me. It look like a cool apps. hangout and earn? Wow! RM500 cash and 1,000 coffee free ? I really need to join this contest and download my NECT. OMG I wanna download this cool app too! Can redeem food somemore, must share out once I downloaded. Thanks babe for ur sharing! Waaa Is it still new? I wonder how many outlets got this rewards point! hehe But it was really a cool apps =D Can redeem food and points!! Such a cool app to install into my smartphone. I love the fact that its user friendly and i also find that its a great way to share lifestyle experiences of different people. i find it cool they made a bloggers' special in the app too.. would be very useful indeed to use. thanks for the intro seriously this is the first time i hear of this cool rewards app. must try it out. something new ! never know this apps before !